"Where do I begin with thanking Jenni and her team for the most beautiful flowers I’ve ever seen in my life?!! I met with three different florists and had told them all the same vision for my wedding day, I always came back to Jenni and Wild Hill Flowers. She totally understood my vision and made me feel at ease that it was going to look exactly the way I wanted it to. When I walked into the church on my wedding day to do my first look with my dad, i started crying, my flowers had exceeded my expectations. I knew my flowers would be beautiful, but I didn’t know they would be so large, fluffy and amazing! She totally took my vision and ran with it. My bouquet was so beautiful I was getting compliments on it all day and people are still commenting on the beauty of my flowers! What I also loved about Jenni is she did a mock trial run through of what our large centerpiece arrangements would look like. I wanted to see the size of them with the UltraPom rentals and votives and I fell in love! Jenni is so organized and very quick to respond to any small change I would make along the way. You can give her a picture and know it will turn out exactly how you want it. Thanks so much for making my dream wedding come to life and my reception look so magical with your floral I could go on and on! My overhead hanging piece above the head table looked like a fluffy magical floral cloud it was perfect!! Hurry and book her, you won’t regret it!!!!!" When our flowers arrived at the venue on the day of, my jaw DROPPED. They were absolutely stunning! 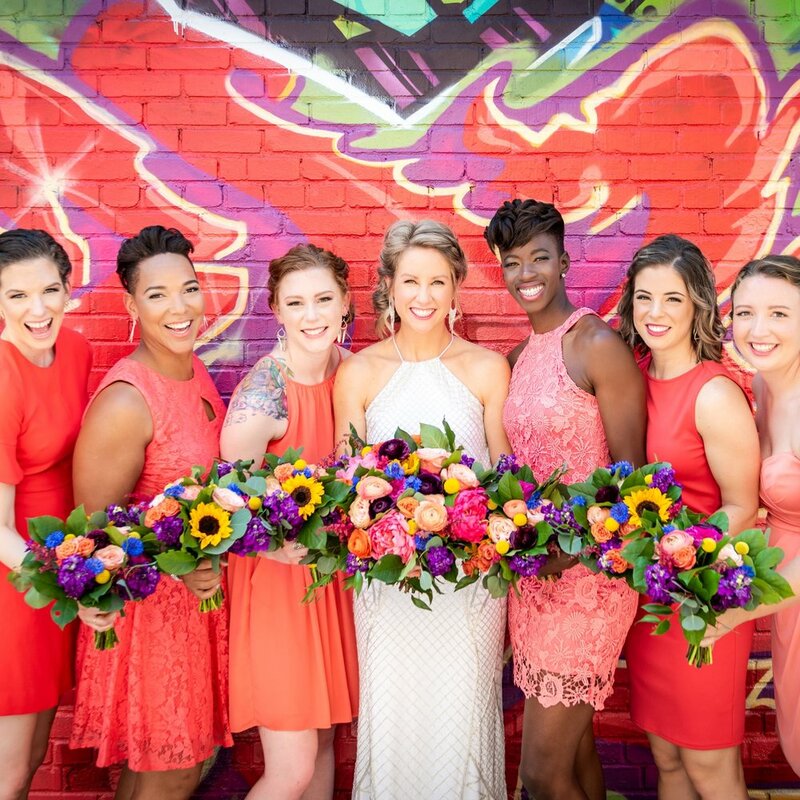 So much color and texture, they were the highlight of the wedding! Every guest complimented the bouquets and wow, they made our wedding party pictures really pop. On top of creating beautiful arrangements, Jenni herself is a doll. I had a few last minute (within the last 2 weeks) additions for corsages and bouts, no problem. The entire process was stress free, payments were easy, and interactions with Jenni in person and via e-mail were prompt and professional. I highly recommend using Wild Hill for your floral! 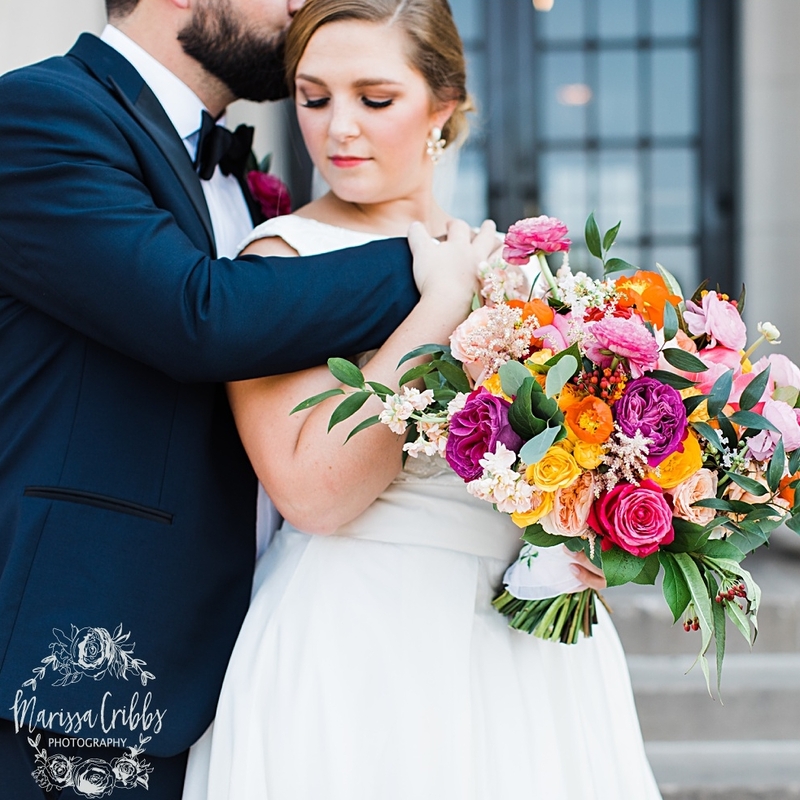 Jenni from Wild Hill Flowers was absolutely wonderful for my Sept. 2017 wedding! From the onset, she was easy and fun to work with. I did not have specific flower types in mind, but I had pictures of the "style", "feel", etc. that I was looking for. Jenni was very intuitive and detailed in her plans for the day and helped me get comfortable with things from afar, since I do not live in Kansas City! She also was very helpful as I added and revised our plans a few times. Jenni was always willing to make additions in one area and compromises in another, in order to accommodate the requests I made while staying budget-friendly." 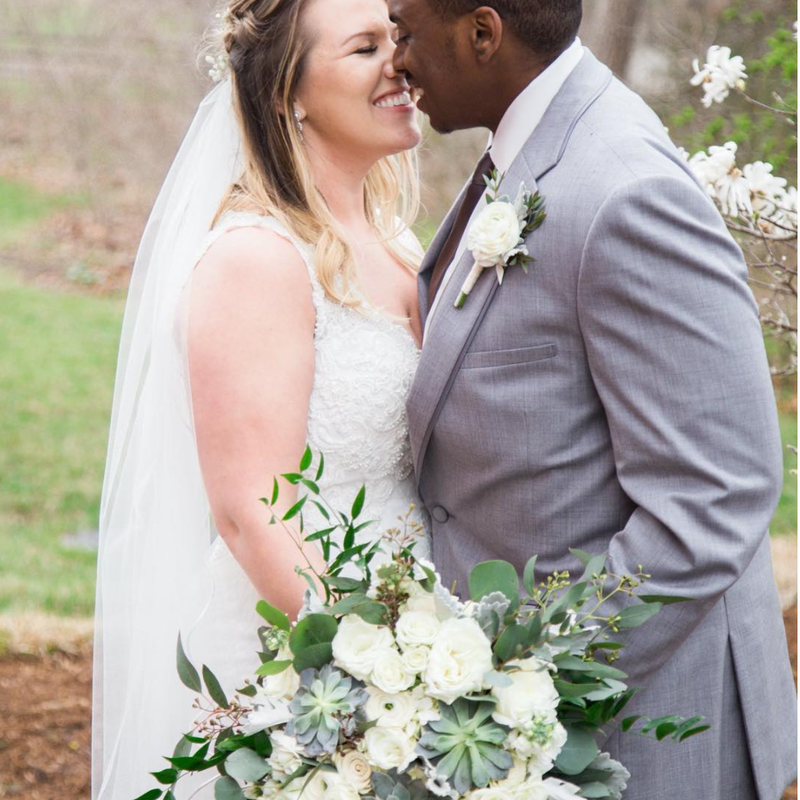 My flowers were one of my favorite parts of my wedding. Jenni did a phenomenal job on all of the bouquets, centerpieces, flowers for the wedding arch, corsages, boutonnieres, and flower crowns. I told Jenni my favorite flowers and she was able to work all of them into my bouquet. She is a true artist but really takes to heart what you ask for and she finds a way to work your ideas in. Working with Jenni was one of the easiest parts of my wedding prep yet her work was one of the most beautiful parts of my wedding day. Jenni is absolutely worth the investment!!!!!! "I cannot event begin to give Wild Hill and Jenni the praise they deserve! 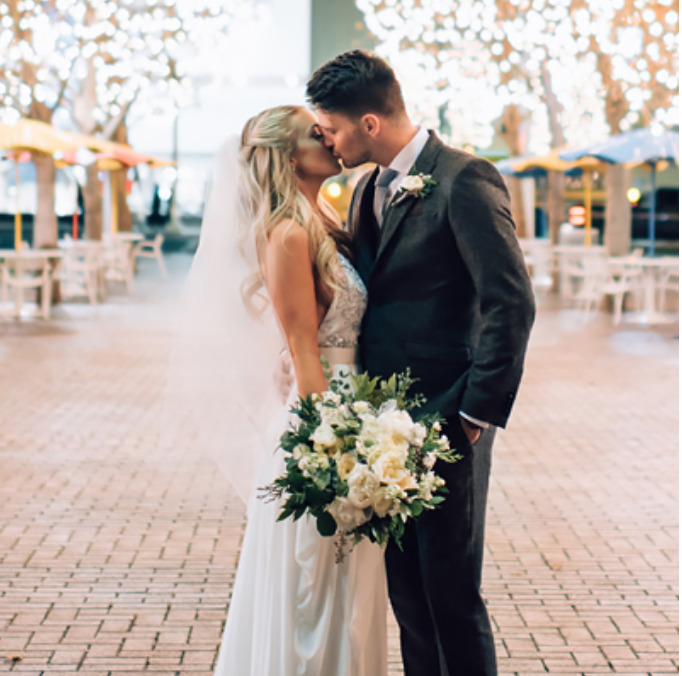 My husband and I got married on 12/16/2017 and we decided to go with Jenni after our wedding planner referred her to us. Jenni was quick to respond and we met to discuss floral needs a few days after our initial contact. I came prepared with only a few pictures I'd found on pinterest, and Jenni ran with it! And lucky she did, because I knew absolutely nothing about flowers or what I wanted. She was an absolute pleasure to work with, always quick to respond and willing to entertain my ideas or last minute changes. The whole night our guests kept asking, "Who did you use as your florist?" Thank you for everything, Jenni! You did a fantastic job. We could not have been happier." I cannot say enough good things about Jenni and her team!! 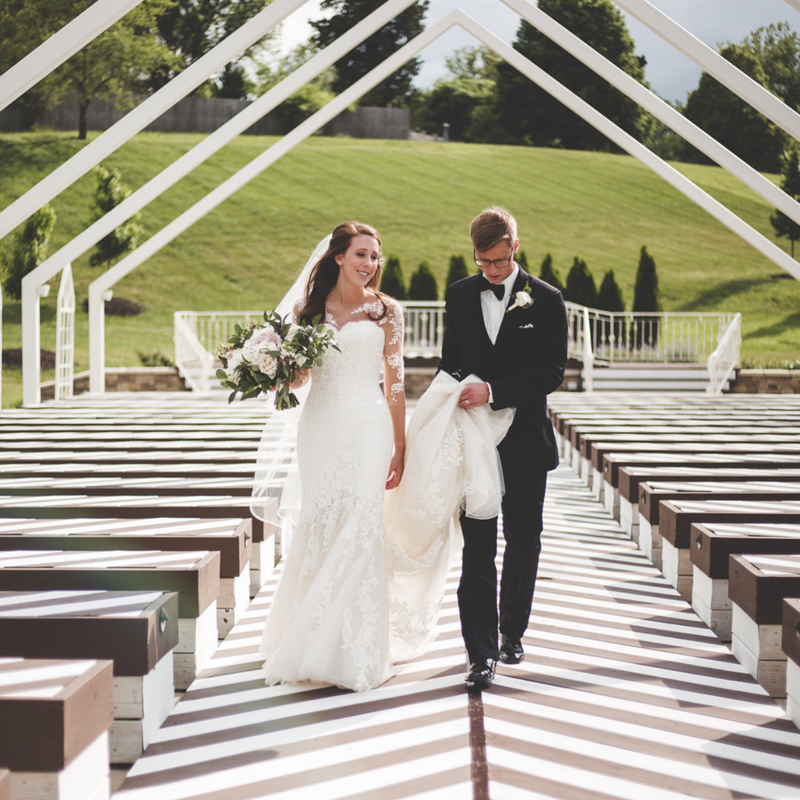 We used Wild Hill for our wedding (and I’m so glad we did)! The floral arrangements were ABSOLUTELY BEAUTIFUL! The colors and flowers were everything I had imagined and more - they really made my vision come to life! The flowers are greenery we’re so fresh and bright, which was exactly what I was looking for. Jenni was so nice, positive, polite, and always willing to work with us. She and her team were readily available the day of our wedding and did an absolutely amazing job! I highly recommend Jenni with Wild Hill! In addition to flowers we also used Wild Hill for their month of coordination service for our wedding. Elizabeth and her team are AMAZING!! Elizabeth truly went above and beyond to make our day flawless! 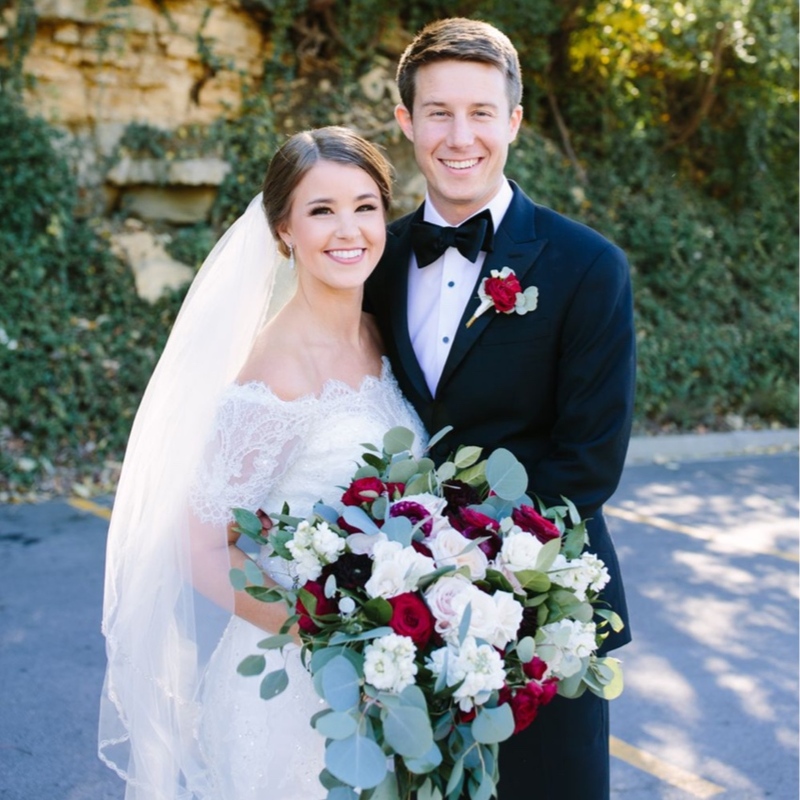 She was always friendly, organized, trustworthy, creative, and willing to work with us throughout the wedding planning process! She was easy to stay in touch with and was available to answer any questions. Elizabeth contacted each vendor and helped create a day of timeline which alleviated a lot of stress. It was a huge relief knowing behind the scene details were being taken care of. Elizabeth executed the decorating just how we envisioned in a timely and professional fashion!! The day went so smoothly due to Elizabeth’s great coordination! 5 stars doesn’t do justice for how hard Elizabeth worked to make our wedding day perfect! I highly recommend Elizabeth with Wild Hill!! 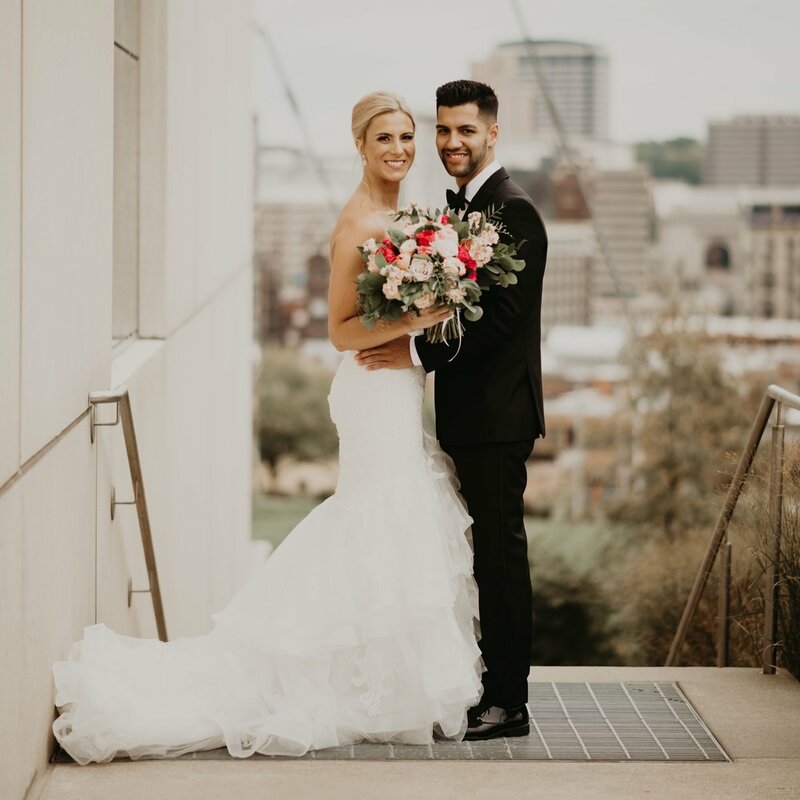 "Jenni literally made my wedding dreams come true. From our first consultation, I knew she was the right fit – it was just like working with an old friend! Jenni is very responsive, enthusiastic, and incredibly talented at her craft. She provided numerous updated proposals as my ideas shifted over the course of a year leading up to the wedding. Her organization skills are excellent and I fully trusted that our plan would be brought to life perfectly." 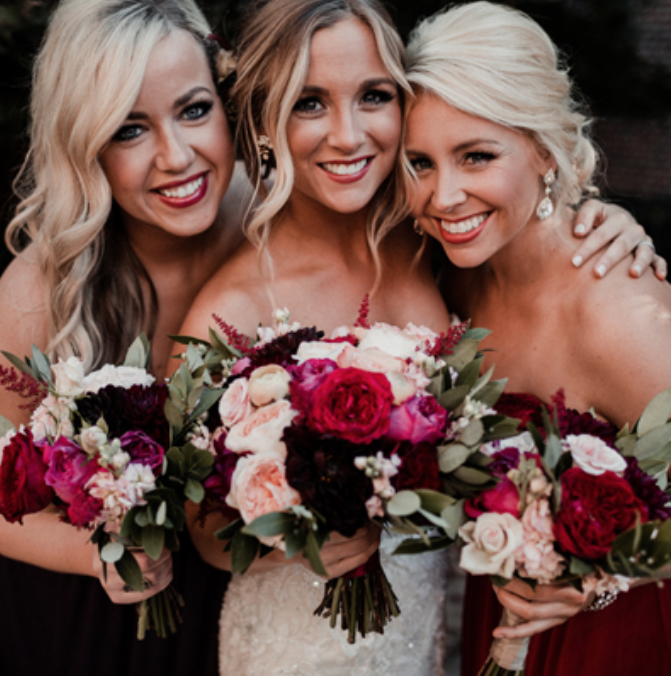 "I can’t even begin to describe the life that Jenni & Wild Hill brought to our wedding in the form of flowers. My vision was very precise, picky, & full of my own personality. I was hesitant to choose a floral designer since my expectations were high; I honestly didn’t think anyone would understand what I wanted. That said, Jenni captured my vision and then some – it was beyond perfect. The flowers were glorious; absolutely my favorite detail of the day. Even my husband was blown away! We can’t say enough nice things about working with Jenni & the Wild Hill team. Thank you so much for making the process seamless and allowing us to trust you fully to deliver the perfect flowers!" “OMG. Wild Hill Flowers and Events/ Jenni and her team did SUCH AN INCREDIBLE JOB on our floral arrangements! During my initial consultation with Jenni, my mom and I described some vague, half-baked ideas of what I hoped for. Jenni assured me that she would be able to bring my vision to life, but I have to say I was nervous because honestly I didn't have a vision so much as a couple photos from Pinterest and Instagram that looked appealing with no clue how to make them appear cohesive. All of Wild Hill's photos on social media looked incredible but I know absolutely nothing about flowers or design... I can just tell you if I love it or I hate it. So needless to say I was kind of winging it and I worried that the the brides I was seeing online with beautiful arrangements had just known exactly what they wanted and how to articulate it. Jenni was patient and wonderful as she helped guide me through the process and was happy to make changes at any time. "Holy cow! Literally the best decision I could have made for my wedding to work with Jenni. She was so accommodating & friendly. She even made a change a week before the wedding on my boutonnières and she made sure I had no worries in the world when it came to making sure it could be done. I can’t wait to see my photos & share the fantastic work she does!" "I truly cannot say enough wonderful things to express how I feel about Jenni and Wild Hill Flowers! From our first meeting she put me at ease and totally understood my vision. 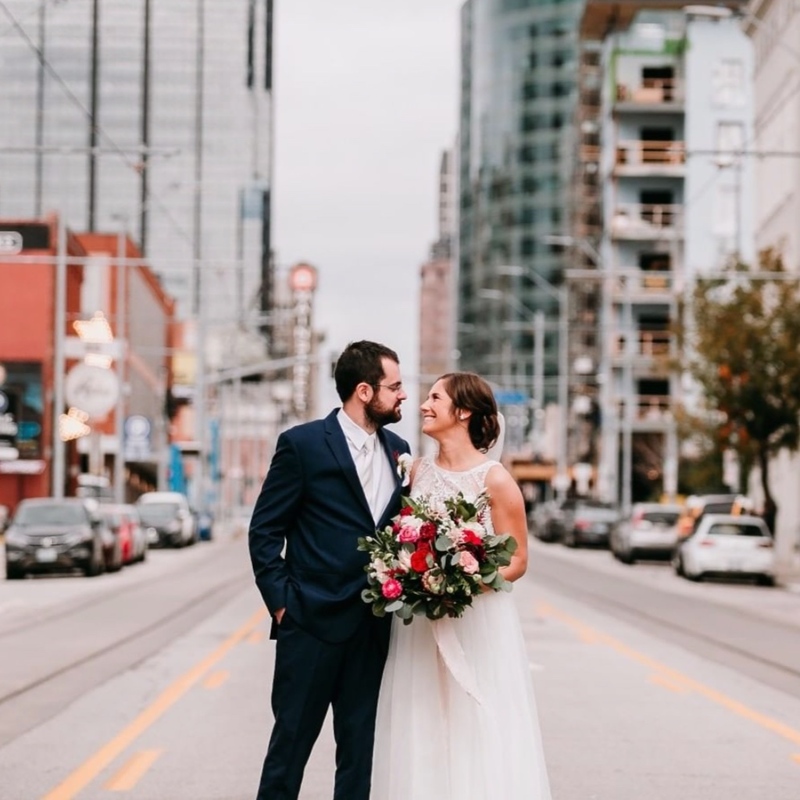 I not only booked her as my florist, but also as my day-of-coordinator and I can say with zero hesitation that it was hands-down the best decision I made, and the best money I spent! 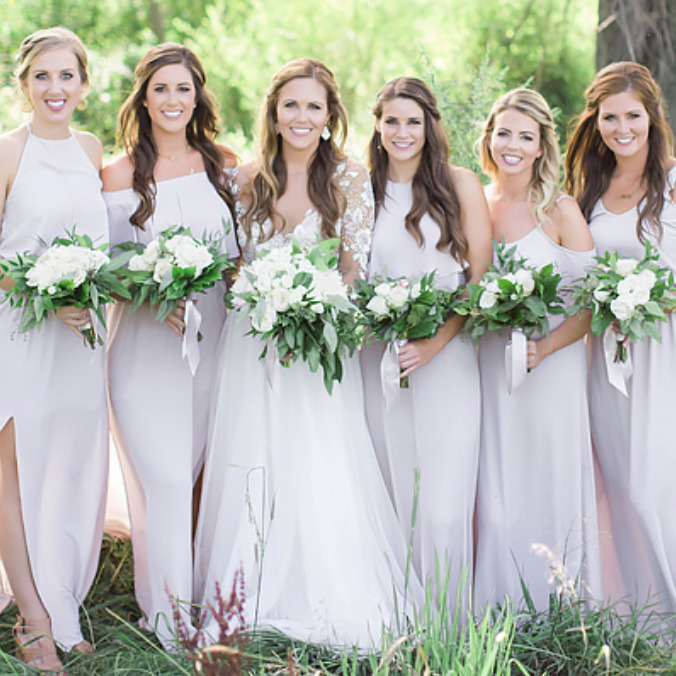 She did absolutely EVERYTHING – not to mention my florals were completely TO DIE FOR!" "I used Wild Hill Flowers for our bouquets, arbor, ceremony and reception decoration, and cake accents. Loved working with the team! Jenni was so helpful and accommodating in every way. When I showed up on the wedding day, everything looked perfect. The best vendors are the ones you don't know are there." " For Jenni: She creates such beautiful things!! 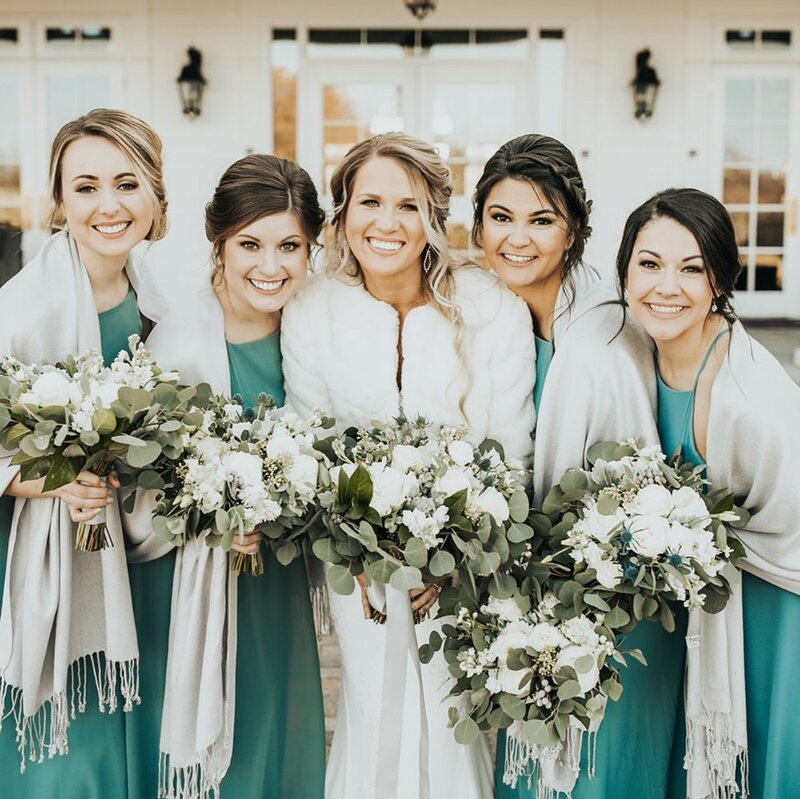 She is thorough, which helps hugely when weddings have so much detail involved, and was so easy to work with in envisioning our style and how we wanted things to look. And she completely matched those desires on our wedding day. 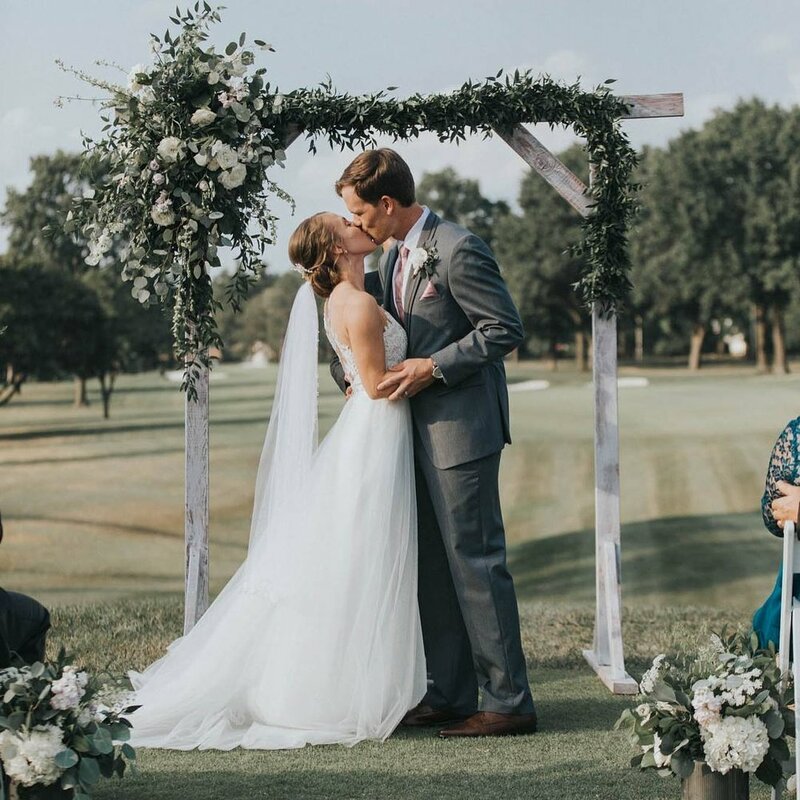 We chose to do a lot of greenery throughout our wedding, and I was blown away by how beautiful I thought both our ceremony and reception turned out..."
"For Elizabeth: She is my personal savior for taking the stress of the wedding day details off of us and for gracefully and discretely handling all of the behind-the-scenes things that go into a wedding, from décor setup to keeping everyone to the timeline to communicating between parties (including vendors and wedding guests) to making sure every detail we'd spent ten months planning actually happened... Additionally, having Jenni and Elizabeth both at our wedding meant that communication and coordination between decor setup and floral setup (closely intertwined) was even more seamless." "So talented! When I started wedding planning I was very excited about the flowers and had a lot of ideas and exact things I wanted. Jenni from Wild Hill Flowers was the sweetest person and was so easy to work with. She responded to my many emails and ideas and saw my vision completely. I was pretty specific with what I wanted... Jenni sat down with me and showed me pictures until we had everything perfect." 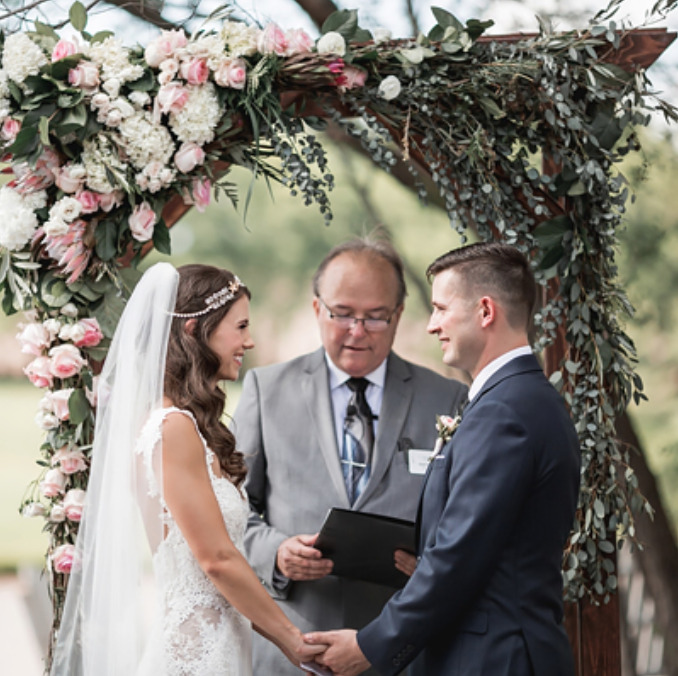 "I cannot express how beautiful all the florals were at our wedding. I honestly wish I could get my bouquet fresh every week to sit on my living room table. Our flower arch was SO gorgeous. Everything was perfect down to every single small detail. Jenni was so easy to work with and so patient when listening to what we invisioned our day to be. She went above and beyond. I would highly recommend using Jenni." 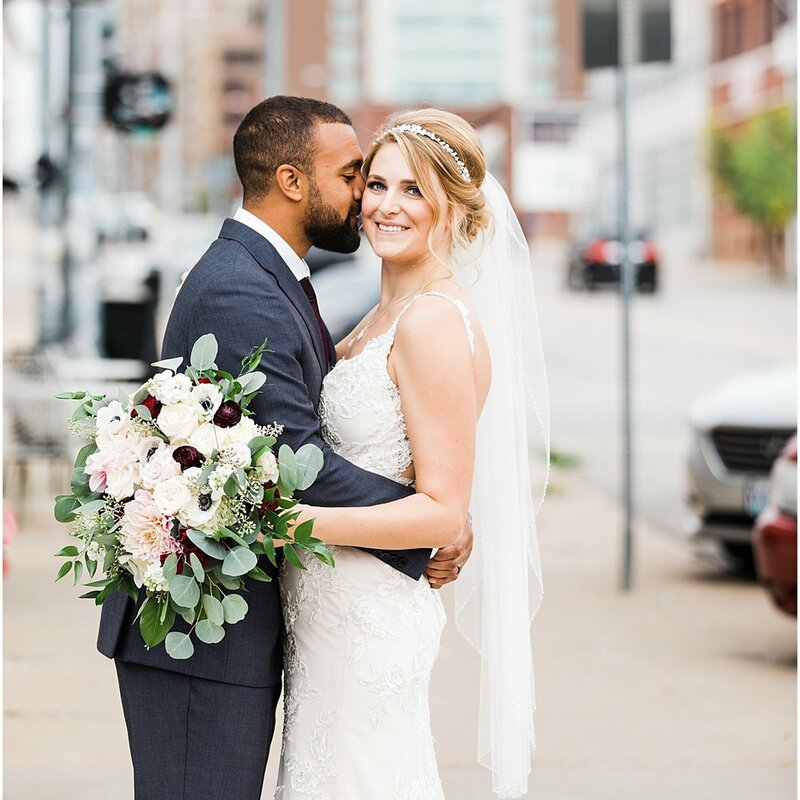 "We booked Wild Hill Flowers and Events for both floral and day-of coordination for our October 2016 wedding, and could not have made a better choice. We met with Jenni to discuss our initial vision about a year in advance, and she was so kind and open to any and all of my ideas (and Pinterest board!). Initially, I didn't think we needed a coordinator, but gave it a shot as all of our family, and lots of our friends, are from out of state. It was seriously the BEST DECISION of the day."